Eileen, Ian, Kelly, and Kevin, all native St. Louisans, have teamed up with Tommy Martin from Dublin to form the band Misla. 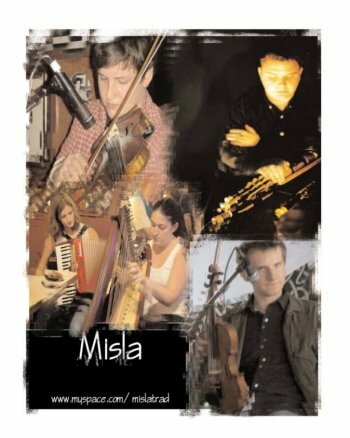 Misla performs traditional Irish music on traditional instruments. Eileen Gannon specializes in the playing of traditional Irish music on the Irish harp. Under the tutelage of Tracey Fleming, Eileen won several medals in International competitions. And in 2000, she was the All-Ireland Senior Harp Champion. She was the first performer from the midwest and only the third American to win this prestigious world title. Several of Eileen’s students have also won honors in All-Ireland competitions. Eileen holds a bachelor’s degree in music performance from and a master’s degree in Ethnomusicology from the University of Limerick. She also holds the TTCT teaching certificate awarded by Comhaltas Ceoltoiri Eirreann and holds teaching positions with Springboard to Learning, the YMCA and St. Louis Irish Arts. Eileen was a member of the St. Louis Symphony Youth Orchestra and has performed with the Clayton and University City Symphony Orchestras, The Musical Diversions Society Orchestra, The St. Louis Women’s Chorale and Irish-Gaelic singer Mary Mc Laughlin. A St.Louis native, Kevin Buckley was first introduced to Irish traditional music at the age of 9 and has since competed, performed and researched extensively throughout the United States and Ireland. In addition to teaching at the St. Louis Folk School, he performs regularly with a variety of both local and international musicians. He is featured on the album “Shady Woods” with Uilleann piper, Tommy Martin. His own album of original music “New Sense” has been met with wide critical and public acclaim.? Ian Walsh began playing at the age of five under the guidance of Greg Crone and Niall Gannon, and he began teaching at fourteen after taking first place in the North American Fleadh Cheoil competition. From there his playing and teaching progressed with four trips to Ireland to compete in the world championships and a gradual gathering of students from around Missouri. At the age of eighteen, Ian was awarded the Gold Congressional Medal from congress for his work with St. Louis Irish Arts and his excellence on the fiddle. He also performs with the The Local Gents, a St. Louis based bluegrass band who attribute heavy influence from the late great Vassar Clemens. Kelly Winter specializes in the playing of traditional Irish music on the piano accordion. Under the tutelage of Triona O’Neill and Niall Gannon Kelly received numerous titles in the Midwest Fleadh Cheoil competitions. In 1998, she was the All-Ireland bronze medalist, making her one of few Americans to achieve such an award. Last year, one of Kelly’s students claimed 1st place in the All-Ireland piano accordion competition. Kelly frequently performs with such well-known musicians as Tommy Martin, Laura Kerr, and Tony Byrne. She also performs regularly with the dance show Emerald Beat at Busch Gardens VA and at the world-famous John D. McGurk’s Pub. In addition, she is a highly sought after musician to play for feisanna (Irish dancing competitions) and travels nationwide doing so. While studying in Ireland, Kelly began playing the concertina and has since started the first concertina school in her native St. Louis. She currently teaches accordion and directs ensembles for St. Louis Irish Arts School of Music Song and Dance.